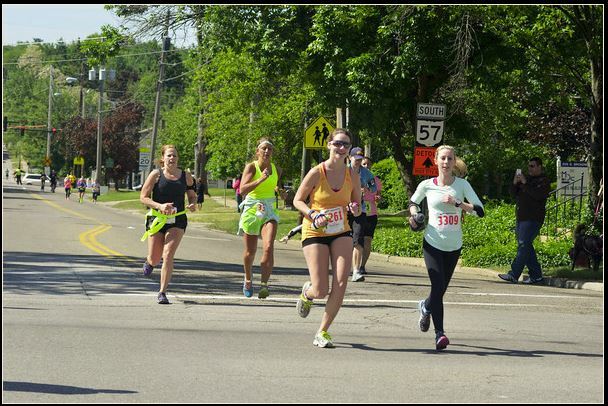 Months ago I found out Medina would be hosting a half marathon through the Medina County Road Runners. I joined the club a few months ago and I am so glad that I did. Not only have my eyes been opened to a bunch of races that I never knew about, but I’ve been able to meet a whole new group of runners in my own backyard. Because this year was a preliminary race to the inaugural race being held in 2014, the half marathon would be free! The event was supported by volunteers, donations through wonderful local companies and help from the community. It was original capped at 350 runners, until a higher than expected 450+ signed up to run. 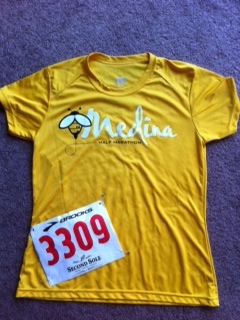 This made my heart smile, knowing that Medina welcomed a running community. 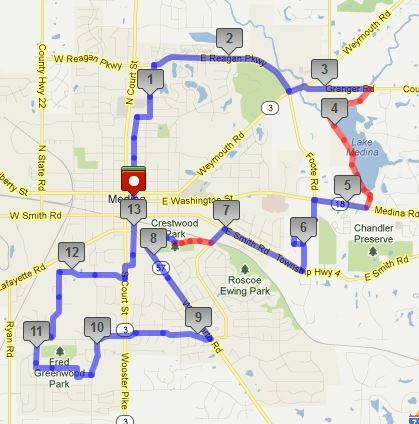 The course was a tour of Medina, starting in the square downtown, running through neighborhoods, around the lake, and back through more neighborhoods before finishing on the square. I had run most of the course many times throughout marathon training, so I was excited that I’d know what to expect. This gave me an extra boost of confidence that would definitely help me out on race day. About a month back, I had convinced a friend and fellow Muskie to run the race with me. 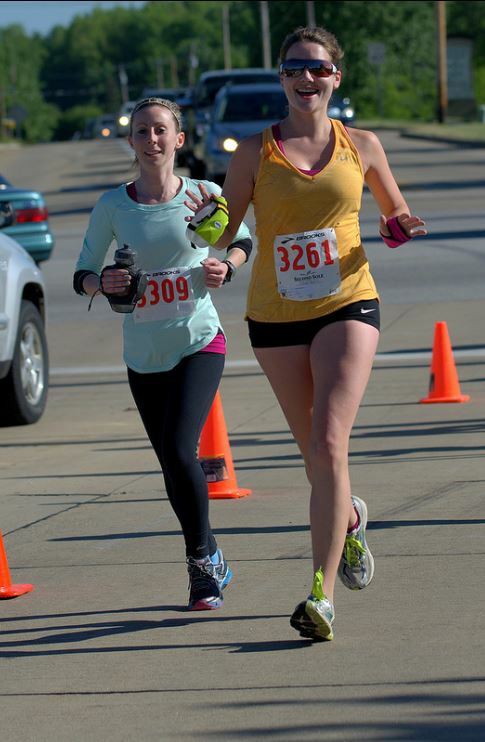 She had paced me to a PR at St. Malachi in 2012 and I hoped that she could help get me out of my funk for this race. Friday night we picked up our packet at the new Second Sole location and drove the course. This wasn’t something I’d normally do, but I wanted Melissa to be familiar with the course because I had no idea what I’d be feeling the next day. Saturday morning rolled around, and I was up bright and early. The race started at 8:00, and luckily because of the cool weather, this wasn’t an issue. It was 35 degrees and Memorial Day weekend, I probably couldn’t have asked for better racing weather if I tried. We headed down to the square around 7:30, another perk of the race being so close. We found parking right away and got in line at the start. About a minute before the start I realized that my bladder was full, but there was no chance to get to the porta potty before the start. I knew that there would be one at mile three, and it would be a very challenging three miles. I didn’t have a goal for this race, well, a dead set goal. I knew that my last three halves had been awful time wise. Last year at this time I was running 2:05, and this year I was lucky if I got under 2:30. I knew my training was a big part of this problem, but I didn’t want this to go on any longer. I wanted to enjoy the race more than anything. This was my new “big” race of the spring, my Flying Pig redemption, I just wanted to be happy running it. We started the race and we were quickly ahead of pace. I tried to slow it down, but I was just too excited. We finally slowed to about a 9:00 minute pace. I felt good, but knew I couldn’t keep it up the entire race. I figured I’d just go with what felt right and see where that took me. Besides for chatting throughout the race, I wanted to dedicate each mile to each of my half marathons. Coincidentally, Medina would be my 13th half, and I was running with a friend who was there for my first, who had helped me train, and was a big part of my running family. It really all seemed fitting, and it helped to keep my mind off of my Garmin. It was also a great way to reflect back on how far I’ve come, remember the good with the bad, and what I’ve learned over the past two years. So back to the race, we started on the square and went North to some of the older neighborhoods and wrapped around Regan Parkway. This area has a few parks off of it and has a few rolling hills. Luckily it was under construction, so I found a porta potty and felt like a brand new person, possibly a minute or two wasted with the line. We turned on to a back road that led to Lake Medina. This is probably one of my favorite places to run because it is absolutely beautiful in all weather. By this point, it was getting warmer and I was started to heat up. I also took some sport beans to keep my energy up. We wrapped up around the lake and headed on Rt 18 to the first big hill of the race. Because this was so close to my home, I knew what to expect and charged the hill, feeling great. At this point we made it to mile marker 5 and I knew Darren would be out watching. I didn’t see him until I finally found him sitting in his car in the parking lot. I waved to him, and Melissa dropped off our cold weather gear we didn’t need. A woman behind me commented on how lucky I was that he came out to support me. Lucky I am. We continued up a gradual incline and made a left into the housing development that I’ve run almost too many times. As we approached the development, I noticed Darren’s car stopped in the middle taking pictures. I quickly ran up to him, gave him a kiss and thanked him for waking up “so early” to watch me. We approached mile 6 and I took my first Gu. I knew that I had been losing energy in the second part of my half marathons, so I needed to make sure I took this now before it was too late. We were at the one hour mark, but I wasn’t concerned. I was feeling great and I felt like I could still keep going without any worry. The second half of the race was pretty much all housing developments. They were mostly shaded which wasn’t necessary but will help a lot next year if it’s hot. It was generally flat with some rolling hills, but honestly I’ve become used to them so I don’t even notice them. We kept things at a 10:00ish pace and were able to talk without losing breath most of the time. The crowd support was awesome along this part of the race, so many people came out of their houses to cheer us on, held up signs and one water stop even had chalk notes written to the runners on the ground. There was no shortage of volunteers or spectators at any point, which really helped to keep up the motivation. With one mile to go, I knew that nothing else could help or hurt this race. I was on a great pace, and decided I wanted to beat 2:15, my first half marathon time. I could feel myself getting excited and had to calm myself down so I had something left for the finish. We turned a corner and started running on brick road. Instant flashback to Muskingum and I had even more energy to finish the race. I started to push it just before the finish and completed my 13th half marathon, in 2:14:13. I loved this race, there is no doubt about it. It wasn’t by best time, but I felt great the entire time. I didn’t have the stress of a PR, and I was about to run with a great friend. This half was exactly what I needed to get my confidence back to where it should be. I know I can run fast and I know I can run a half without having to walk in the later miles. MCRR did a fantastic job of putting on the race and I am so proud to be part of this group. I highly recommend this race for anyone looking for a half after Cleveland next year. The scenery is great, the course is unusually flat for Medina and it’s perfect timing after Cleveland for either redemption or a casual run. I’m sure to talk about it more than once within that time frame, but I can’t help to share it now. Next year’s race will be on May 31st and start at 7:00am. Next year will also include chipped times and an awesome medal (seriously). Registration right now is only $40 so sign up! And that Flying Pig redemption….24 minutes shaved off my time. 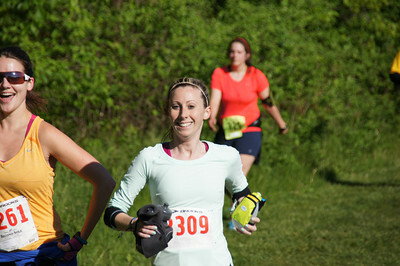 Also I see @emilyruns in one of your photos! That’s how I felt for 3M! I’m so glad you had a race where you felt good the whole time, and check you out with your awesome finish time. You’re inching toward a PR. Oh, and that shirt is adorable. Loving your blog! I, too, ran the Flying Pig and Medina Half. I’ll be running the Akron as a relay. You are faster than me but I’m ancient. Maybe we’ll meet up at one of these races!